Frontwoman and former music teacher Elizabeth Stokes talks their breakout album, the Auckland scene and what it's like to name a band. The Beths’ music exists in a place where every emotion is heightened—hyperbolic, even. On “Happy Unhappy,” one song from the New Zealand band’s excellent debut album Future Me Hates Me, an ex-love lingers in the narrator’s mind just a little too long, leaving her distraught. “But now I’m overthrown / Wish my heart were really made of stone,” she sings. “And I could forget you / Like I really want to.” On whirlwind love song “Little Death,” a crush consumes her, making her feel not only smitten, but also immobile and speechless: “Your smile it makes me weak / And the red spreads to my cheek / You make me feel three glasses in.” Within the loud, reflective world of Future Me Hates Me, every feeling is amplified: Heartbreak is an earthquake; new love is a tidal wave. But for lead singer/band-namer Elizabeth Stokes, mum’s the word on the specifics of those feelings. In interviews, including ours, she’s usually careful not to reveal any startling details. When discussing lyrics, our conversation focuses on process rather than content. Fortunately, Stokes’ lyrics, bristling with detail and imagery (and, thankfully, the farthest thing from “garbage”), need no further explanation. Future Me Hates Me, which arrived Aug. 10 on Carpark Records, is frank enough to work like a journal but universal enough to market as a piece of relatable art. And it only takes one listen to fall for Stokes’ voice, which is at once confident and restrained. With all its tethered emotion, expertly crafted rock melodies and stellar hooks, this record feels more like a classic than a debut, one of many reasons The Beths landed the number one spot on Paste’s list of the best new artists of 2018. After an opening so strong, there’s no telling what they’ll accomplish in the future. Stokes formed the band with guitarist Jonathan Pearce, her high-school friend (and now her boyfriend of three years), plus bassist Benjamin Sinclair and drummer Ivan Luketina-Johnston, who were also mates in high school, when all four were studying jazz at the University of Auckland. Early this year, as they were anticipating the record’s release, Stokes and Pearce began mulling over what the band’s next move would be. They decided on a tour, which meant Stokes had to leave her day job as a music teacher. While powerhouse vocals and bright, electric guitar rule on Future Me Hates Me, it was another instrument that had been occupying Stokes’ days up until she embarked on tour: the trumpet. She taught the horn to students in her native Auckland. The tour that followed was a DIY affair. Stokes and co. did most of the booking themselves, and they primarily played tiny rooms, like the Drunken Unicorn in Atlanta, where a small but fierce crowd packed the sticky yet stupendous shoebox to its capacity. As touring stretched on, their music began to catch fire, too, in Oceania and beyond, but especially here in the U.S., where they’ve since landed on many end-of-the-year lists, including Paste’s rankings of the best albums of the year and the best debut albums of the year. People in Auckland really love music, too. Before things started to take off with The Beths, Stokes, Pearce, Sinclair and Luketina-Johnston all crossed paths within the New Zealand metropolis’ busy music scene. While the city itself boasts around 1.6 million people, the music community is tiny and supportive, so much so that Stokes says that coming across a new face is a rare occurrence. Stokes and her bandmates are proper examples of that musical diversity. Stokes was playing acoustic guitar before she ever met her first trumpet or electric guitar, and she even played in a folk band in a high school. But while jazz played a role in The Beths’ genesis, it doesn’t contribute much to their present, unless you count the collaboration factor. “We just love playing music like together in a group,” Stokes says. “That’s something that’s really exciting and something that is really physically enjoyable, just locking in with each other and playing with other musicians, which I think kind of sprung from studying a collaborative music, which is kind of what jazz is. Sonically speaking, though, The Beths’ sound couldn’t be more unlike the jazz compositions they studied at university. The Beths more resemble the great indie-rock bands who came before them, like Rilo Kiley, a favorite of Stokes’, and classic bands like The Rolling Stones and The Modern Lovers, two of Pearce’s picks. Take those influences and add a pinch of pixie-punk, then you’ve got Future Me Hates Me, a confessional, shimmering slab of Pacific pop. Not only is the band physically fronted by Stokes, but, as you may have gathered, the group also bears her name, a decision she attributes to one of television’s most fiercely independent—and assertively witty—women. If The Beths is Stokes’ brainchild, then it only makes sense that she appears as the band’s matriarch, the lone leader backed by three dudes. On the record, Stokes’ lyrics are often supported by backup vocals that sound a bit like boy band material, or maybe the fanfare of a barbershop quartet, an unlikely but welcome take on singing rock ’n’ roll. 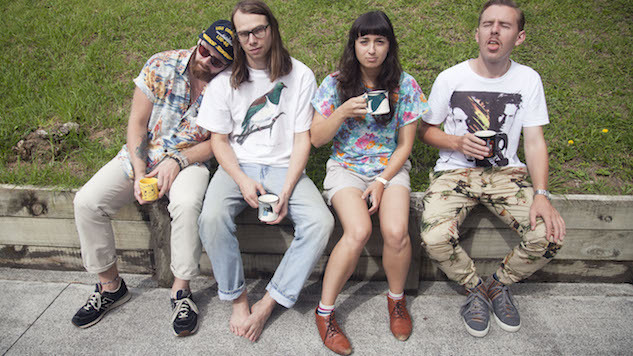 In winter 2019, The Beths will commemorate their big year by embarking on another North American tour, which includes an appearance at South By Southwest, with fellow indie-rockers Bad Bad Hats. Meanwhile, they’ve got plenty to celebrate: Outlets far and wide, including NPR Music and Rolling Stone, named Future Me Hates Me one of the best albums of the year.